One of the grooviest albums from the 70s KPM sound library – a set that features loads of upbeat vocal numbers in harmony, conducted by two of the swingingest cats to ever work for the label! 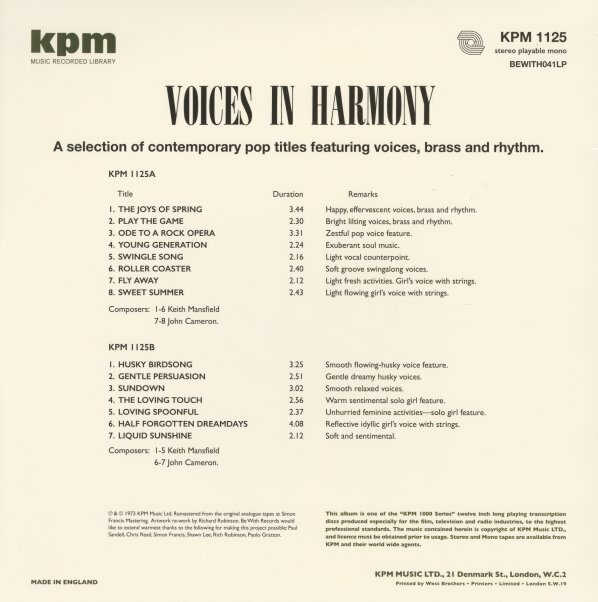 Vocal material is a bit unusual in the KPM world – which usually focused on the kind of instrumental tunes that could easily be borrowed for use in films or broadcast – and in a way, that vibe is still followed here, as most of the material is wordless – with a scatting chorus of gal and guy singers working together, taking the place of the other instrumentation that might have been in the lead! At the bottom are plenty of funky rhythms and other sound library-styled grooves – bursting with the great energy you'd know from Cameron and Mansfield's other records – on titles that include "Half Forgotten Dreamdays", "Liquid Sunshine", "Fly Away", "Sweet Summer", "Ode To A Rock Opera", "Young Generation", "Play The Game", "Swingle Song", "Roller Coaster", and "Gentle Persuasion". © 1996-2019, Dusty Groove, Inc.